Fort Worth originated as a railway hub. Although a lot has changed, rail travel is still a fantastic way to get to and from Downtown Fort Worth. 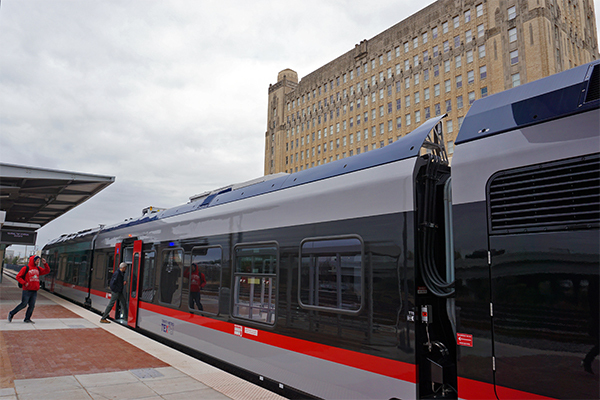 TEXRail is a new commuter rail line serving 9 stations over 27-miles from Downtown Fort Worth, across northeast Tarrant County, through North Richland Hills and Grapevine, and into DFW International Airport’s Terminal B. This is a cost-effection option for traveling into Downtown Fort Worth or commuting to the airport. Visit the TEXRail website for more information. The Trinity Railway Express (TRE) is a quick, efficient, and cost effective way to travel between Fort Worth and Dallas. With two convenient stations located in Downtown, the TRE is a great option for commuters, visitors, and locals alike. Visit the TRE website for more information. Visit the Amtrack website for more information.